After the end of her marriage, Marcia Reece dated 59 men over ten years and found out how NOT to find Mr. Right. Then the Marriage Mouse came into her life…and everything changed. Since then, she and the Marriage Mouse have helped scores of singles find a love as wonderful as hers. Readers discover how to get the relationship rats out of their life, forgive themselves for the past, attract the right partner, and more. Marcia Reece has had extensive national television and print media coverage. Laugh with her as she recounts her adventures, and benefit from her learnings. 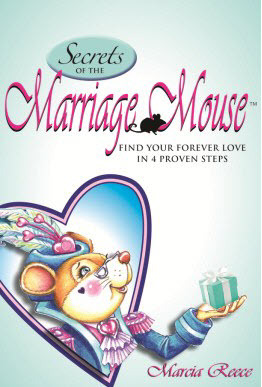 Secrets of the Marriage Mouse is available online here.